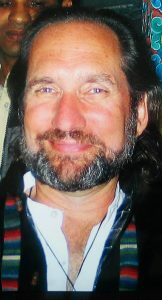 Gregory Besek is a lifelong spiritual practitioner and religious mystic. Raised a Roman Catholic, Greg began his extended spiritual training in 1972, becoming a solitary monk and taking the Hindu Brahmacharya vows of poverty, chastity and obedience. In 1974, he was accepted into a Hindu Ashram where he lived for 5 years as a monastic under the tutelage of Guru Maharaj Ji of Hardwar, India. Here he studied and practiced the essence of the Hindu Vedic lifestyle of service, satsang and meditation until 1980. As a result of a spontaneous spiritual experience in the 80’s, Greg was lead into the mystical world of Shamanism. During the next 20 years, he studied with many renowned individuals in this field including Michael Harner of The Foundation of Shamanic Studies and Aama Bombo of Nepal, recognized as one of the 13 Indigenous Grandmothers of the World. He further studied with shamans of Peru (Don Oscar Miro Quesada), Tibet (Dr. Larry Peters), Native America (Don Cardinal), Western Europe (with Celtic Shaman Tom Cowan), Europe, Northern Africa and Northern India (Romani Gypsy shamanism with Patrick Jasper Lee), Korea (Hiah Park) and Mongolia (Sarangerel). In 1994, Gregory began a teaching center called “The Center Pole” whose guiding light was in “keeping ancient spiritual traditions alive”. Through The Center Pole, Greg conducted hundreds of workshops, lectures and seminars for people along the east coast helping those attending to follow their deepest desire, a oneness with their own heart. To deepen his spiritual experience, Greg began exploring Zen Buddhism, becoming a Precept Holder in the Zen Peacemakers Order headed by Roshi Tetsugen Bernie Glassman. He has also taken Vows of Refuge in Tibetan Buddhism from the Venerable Khensur Rinpoche Lobsang Tenzin. In 2008, Gregory began and continues to work at Wesleyan University in the Department of Religious and Spiritual Life where he is the Coordinator of the Vespers Program (evening prayers) and where he lectures and teaches about spirituality and religion. Greg has practiced and studied numerous forms of meditation for over 43 years which include Hindu, Vedanta, Buddhist, Tantric and Christian traditions. He partakes yearly in extended silent meditation retreats to help further awareness.